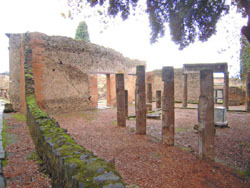 This building is clearly visible from the sea as it is situated on the promontory of the hill of Pompeii and commands a wide view over the plain below. Passing along Via dell’Abbondanza to the end of Via dei Teatri we find a portico with three Ionic columns and a semicolumn which form the entrance to the Triangular Forum. The Hellenistic style arrangement of the area, which has a colonnade with 95 columns, dates back to the 2nd century B.C. This intervention created a harmonious protective curtain around the pre-existing Doric Temple and at the same time annexed this sacred area to the theatre district and the two gymnasiums as the foursided portico behind the stage of the Theatre was connected to the Triangular Forum by means of a stairway. Three openings along eastern portico connected it to the far hemicycle of the Large Theatre and the Samnite Gymnasium. The Doric Temple was built using limestone from the Sarno valley during the mid 6th century B.C. and was dedicated to Hercules, although it was later also adopted for the cult of Minerva. However, although it was abandoned some time before the destruction of Pompeii. The monument had seven Doric columns along its shorter sides and eleven along the longer ones. At the foot of the steps leading up to the temple there is a tomb-like structure which was probably a monument erected to the cult of the founder of the town. In front of the remains of the temple there are three pre-Roman tuff-stone altars and a well surrounded by a circular building with Doric columns, while at the rear we find a semicircular tuff-stone seat which enjoys an uninterrupted view of the Gulf of Naples.